Ormyrus orientalis, copyright ICAR-National Bureau of Agricultural Insect Resources. 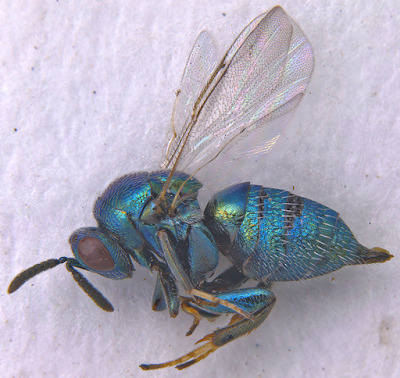 The Ormyridae are a group of chalcidoid wasps that parasitise plant galls of other insects (Bouček 1988). The majority of species are included in a single genus Ormyrus; attempts to divide this morphologically diverse genus into finer subgroups have generally not been successful. See also: Ormyrids: attacking the gall. Characters (from Bouček 1988): Antenna thirteen-segmented; gena posteriorly rounded; occipital carina present, horseshoe-shaped; pronotum relatively short; notauli complete, posteriorly subparallel; forewing with marginal vein at least five times as long as narrow pedunculate part of stigmal vein, without linea calva; tarsi five-segmented; gaster always strongly sclerotised, often with coarse sculpture, sometimes sculpture reduced to small longitudinal ridges bearing a bristle at apex; male gaster broader than high, with at least a blunt edge on sides; cerci reduced to low plates, placed on undivided sclerotised epipygium which is subconical in female, or in form of transverse plate in male; ovipositor not exserted.